Cozy Chicks: Well, are you coming? The Cozy Chicks would be pleased as holiday punch if you'd join us for our annual holiday party. WHEN: Tuesday, December 13th, from 7 to 9:30 pm (although a few of us might hang around later). Click this link to RSVP our invitation! WHO: Us, of course, The Cozy Chicks. Lorraine Bartlett, Duffy Brown, Mary Kenned, Mary Jane Maffini (Victoria Abbott), Maggie Sefton, Karen Rose Smith -- and we hope ... YOU! 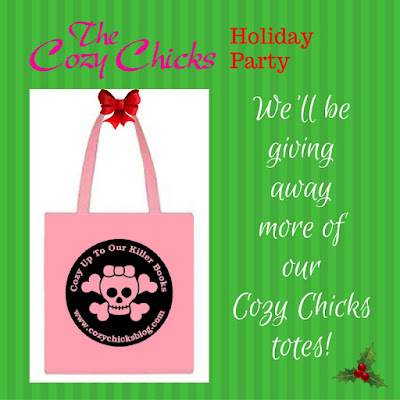 WHAT CAN WE EXPECT: Virtual holiday goodies (think recipes and pictures), pictures, and prizez -- like Cozy Chicks goody bags, totes and lots more!